Call them the “mash and slash” Office apps. 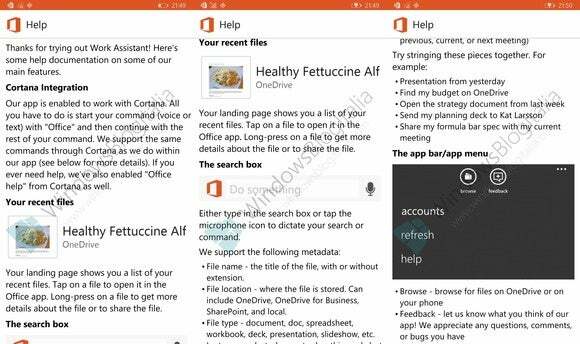 A new wave of productivity apps from Microsoft appear to have either one of two goals: mash together two or more Office apps, or strip down an existing Office app to its bare parts. Last fall, those apps included Sway and Delve, Microsoft’s content-creation app and its tool for finding relevant contacts and information, respectively. But Microsoft’s new approach includes four new productivity tools: “Office Now,” OneClip, Revolve, and Flow. And Microsoft said Thursday that, as promised, its Sway app had begun rolling out as part of the full-fledged Office 365 suite. Much of the credit goes to Twitter user Walking Cat, who posted shots of the apps themselves or even links to download the files themselves, including OneClip. Microsoft, however, declined to comment. "The Microsoft Garage is always creating, developing and testing all kinds of amazing ideas," a spokesman said in an email. "We don’t have specific details to share right now." Why this matters: Besides Zoho, a little-known productivity apps developer, there are very few companies actively trying to improve the productivity experience across the board—most are targeting a few narrow pain points. For its part, Microsoft has gone far beyond that, redefining the boundaries of apps and the nature of productivity itself. Think about it. Outlook.com now has plug-ins and addons. 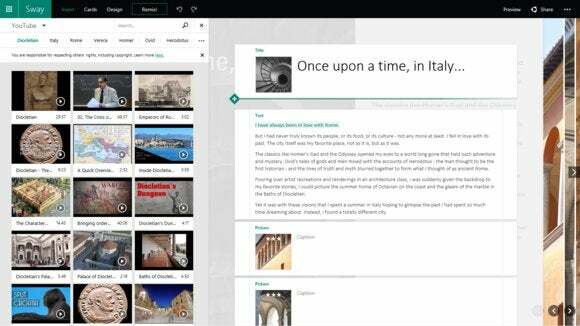 Sway combines Word, PowerPoint, and Bing. There’s context and collaboration to a level that was unheard of a few years ago. So what are these apps? 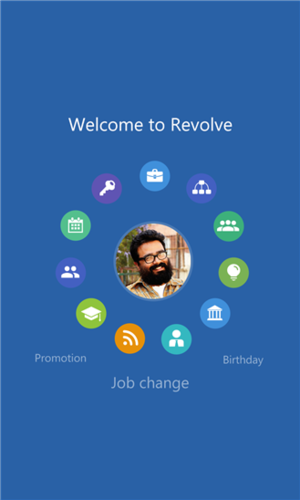 Basically, Revolve is like Delve, but for your next meeting—pulling together elements of Outlook, Lync (now Skype for Business), and other Office components. Think of it as a cheat sheet on who this person is, what he likes and dislikes, your interactions with him, and so on. So far it all looks rather personal, but you can imagine this being a valuable tool for salespeople—if it’s built out that way. OneClip: Honestly, OneClip seems tailor-made for me personally. Comments on the Windows Phone Store (right now, it’s another app in private beta) describe it as the perfect solution for moving snippets of data, including URLs, text, and photos, from one platform to another—including iOS, Android, Windows phones, and Windows PCs. You could think of this as OneNote without the notes, or Pushbullet; something more like a cross between Google Keep and Dropbox, possibly. Links to the app are available on Walking Cat’s Twitter feed. I often take a photo with my phone, then wait for it to move to OneDrive, then download it back to my PC. OneClip appears to be a synced folder between your phone and PC, so content can roam back and forth. It’s not a critical app (after all, there are plenty of ways to move content back and forth, including a wired cable) but it seems to be a nice convenience for Windows PC users. As the screenshot seems to indicate, Flow is essentially a stripped-down version of Outlook, with an emphasis on chatting, rather than formal emails back and forth. It reminds me of the way Facebook Messenger used to work, with the lines blurring between real-time messages and emails that were archived in an inbox. 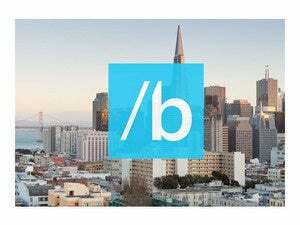 Speaking of Inbox, thank goodness Microsoft didn’t go that route. 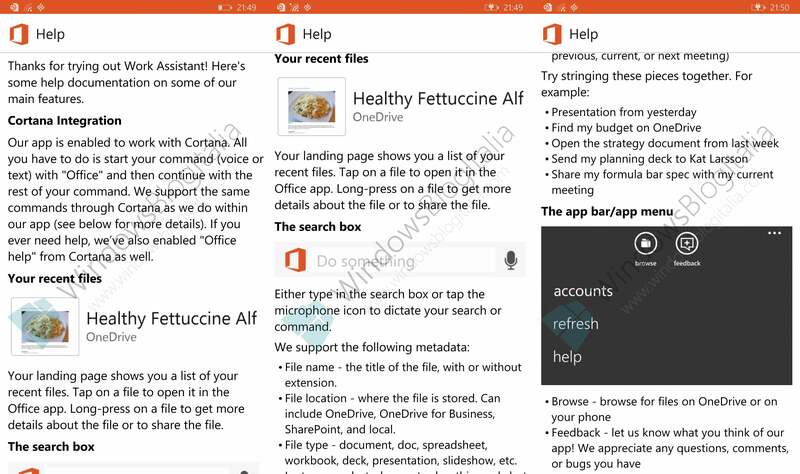 WindowsBlogItalia’s alleged Work Assistant screenshots detail Cortana integration. The new features that apparently have been included in the latest update seem designed to speed you on way to meetings, both today and tomorrow. Travel cards note any offsite meetings on your calendar for tomorrow, and “atypical” notifications alert you if a meeting room changes or is booked. And your lock screen of your Windows phone will give you your schedule, how much time you’ll spend in meetings, and when the last one of the day will take place. Five years ago, could you ever think you would be truly excited about new productivity apps from Microsoft? Yet here we are. If it all pans out, these four apps could be truly useful stuff. I can’t wait until they arrive. Updated at 12:09 PM with a statement from Microsoft.